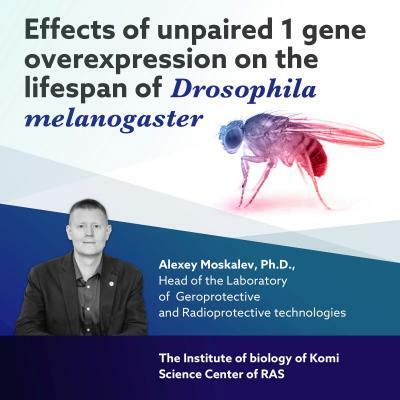 Wednesday, April 3, 2019 – Alexey Moskalev, Ph.D., Head of the Laboratory of Geroprotective and Radioprotective technologies, and co-authors from the Institute of biology of Komi Science Center of RAS announce the publication of a scientific article titled “Effects of unpaired 1 gene overexpression on the lifespan of Drosophila melanogaster” in BMC Systems Biology – an open access journal publishing original peer-reviewed research articles in experimental and theoretical aspects of the function of biological systems at the molecular, cellular or organismal level. The conducted study evaluates the effect of overexpression of the unpaired 1 gene in different tissues on the lifespan of Drosophila melanogaster. The JAK/STAT signaling pathway is involved in regulation of many processes at different levels of organization. At the cellular level, such processes include cell division and differentiation, survival and programmed death, gene expression, and chromatin complex. The JAK/STAT signaling pathway determines the ability to renew and maintain tissue homeostasis by controlling the function of stem cells and the genesis of differentiated cells. All the processes affect cellular and tissue longevity, and the expression of proteins, belonging to the JAK/STAT pathway, declines with time. However, the beneficial effect of their stimulation on longevity and health has not been researched until recently. Using the animal model of Drosophila melanogaster, Moskalev Lab studied the lifespan effect of the increased activity of the unpaired 1 gene, which encodes the ligand of the JAK/STAT pathway – a signaling molecule that causes the launch of the system. Unpaired 1 overexpression had different effects, depending on the tissue, where this gene was activated: increased regulation in the nervous tissue and fat body (similar to human liver) increased the lifespan, while activation in the intestine led to harmful tissue changes and shortened the life of the flies. This study indicates the possibility of regulating lifespan and aging rate through interventions into the JAK/STAT signaling pathway. The easiest way to activate and suppress corresponding mechanisms is the usage of pharmacological agents and biologically active substances. Application of new analysis algorithms and existing data libraries (for example, DrugAge and Geroprotectors.org) allows to define such controls for the JAK/STAT pathway. And since it is an example of evolutionary conservation, the effects of new drugs can potentially be applied to humans. If they meet the criteria of geroprotectors, they can be an effective means of achieving longevity and improving the quality of life. However, a detailed analysis of possible side effects is still required. “There is an increasing interest in the mechanisms of aging and longevity as a source of targets for drugs against age-related diseases. Unpared, the cytokine JAK / STAT pathway, might be a new potential target to increase human lifespan,” said Dr. Alexey Moskalev, Ph.D., Head of the Laboratory of Geroprotective and Radioprotective technologies. The laboratory of geroprotector and radioprotector technologies of the Institute of Biology Komi SC UrB RAS is regularly publishing research papers in peer-reviewed journals. The laboratory’s research is aimed at studying the molecular and genetic mechanisms of lifespan regulation, aging process, stress- and radioresistance. The scientific team succeeded in identifying several dozen genes with pro-longevity action. Geroprotective effects of various pharmacological agents, natural compounds, and plant extracts on aging-related signaling pathways, lifespan and physiological functions are being actively studied. Thanks to the members of the laboratory team, data libraries DrugAge and Geroprotectors.org have been created in collaboration with leading institutions of the world. In addition, studies on the influence of factors of different nature, primarily in small doses and concentrations, on lifespan and non-linear effects (such as hormesis and adaptive response) are being carried. All studies are conducted at a high scientific level with the use of modern methods of obtaining data, their statistical and bioinformatic analysis. The Institute of Biology of Komi Scientific Centre of the Ural Branch of the Russian Academy of Sciences (IB Komi SC UB RAS) was founded in 1962. The Institute is the largest academic research centre of the East European part of Russia, with biology and ecology as two primary areas of research. The Institute consists of six departments and four laboratories, the Zoological museum, the Botanical garden and the Herbarium (SYKO). The main fields of research include the study of biodiversity, structural and functional organization, stability and productivity of taiga and tundra ecosystems, biological effects of ionizing radiation and other physico-chemical factors on cells, living organisms and natural ecosystems; problems of radiation and ecological genetics, as well as the development of methods for monitoring, bioindication; creation of inventories and databases of biological resources of the European North-East with the use of remote sensing and GIS technologies.